The 2016 BEST TV shows were AMAZING this year. 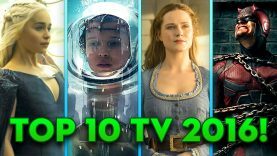 But these are the Top 10 TV Shows of the year, and it’s a controversial list. Considering television shows are the best they’ve ever been, it was very hard to cut out a lot of shows, but the nerds pulled it off. Filup Molina shares with the Top TV Shows of 2016 are, and WHY you need to watch them.